Today is the la Fête du Travail in France and the symbol of this public holiday – in honour of workers’ rights – is the lily-of-the-valley. Lily-of-the-valley swamps us with its appearance everywhere at this time of year. Not just in our gardens: on street corners in towns there are people offering little bunches of it (a change from, ‘Buy some lucky heather?’), and Aldi and Lidl dish it up to us in small pots by the hundred. The custom is said to have started on May 1 1561, when an unknown citizen presented King Charles IX with a bunch of lily-of-the-valley as a token of prosperity for the coming year. He began a tradition of presenting ladies at the court with lily-of-the-valley each May Day. By 1900 French lovers were exchanging bunches – and the habit began to spread amongst close family members as well. So today, when you go to visit your maman or mamie, it would be very bad form if you failed to take her some lily-of-the-valley. I planned to use my own (flowering, amazingly, for quite a few weeks now) in a vase this May Day – the rhizomes came originally from my mother’s garden in Scotland and are now slowly establishing. But not nearly as well as they do in Scotland! The little vase is one I call my ‘snowdrop’ vase – so long with me that I can’t remember where I got it. I popped some of its own foliage into the vase with a little sprig of the vetch Vicia sativa. I love the vetch when it’s flowering, but later on when it starts bouncing up amongst the rhizomes of irises my delight turns to curses. And then I was kind of inspired to go on an make a trio of vases. Taking a walk out in the garden on this slightly rainy May Day, I felt like picking a little of Exochorda macrantha ‘The Bride’ and Victor Lemoine’s lilac ‘Belle de Nancy’. If you want to know more about Lemoine, a breeder who came from the city of Nancy (our capital in Lorraine), have a look at this old post. Here is his lovely deep purple lilac, just beginning to really do its thing chez nous. My shrubs are all so small here that this seems rather cruel. However, it IS raining and there are other flowers, so I dared. The Exchorda is not at all happy being told what to do in a vase. The flower stems are drooping and I noticed this morning that it starts to flower from the top down, so the leading flower on the spike is always the oldest – a nuisance if you are arranging it, when you want the freshest, sweetest at the top. 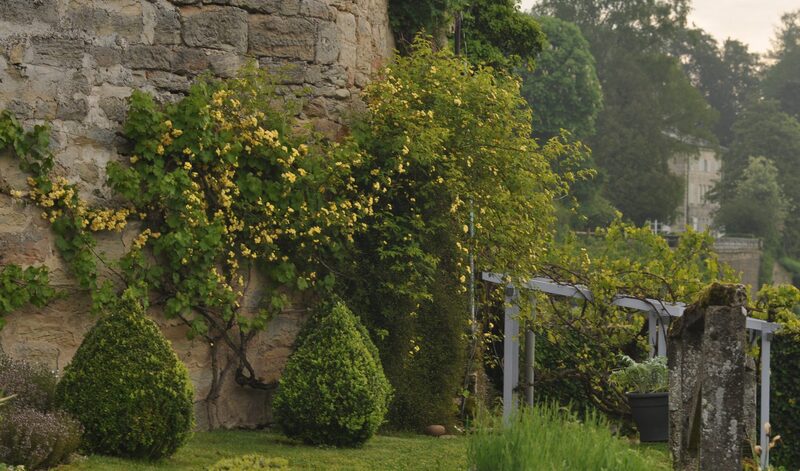 I also used Rosa banksiae ‘Lutea’, whose flowering stems are just as difficult to place in a vase, although it looks so graceful draped down a stone wall. Finally, almost for foliage, the young shoots and buds of Spirea betulifolia It was in the garden when we arrived here, and named for me by another Monday vase-maker last year when I used it. Thanks so much again – it’s a fluffy little sweetie when the flowers open! I did think that the rose looked particularly delicious with the purple of ‘Belle de Nancy’. Hop on over and see what the others are doing at Cathy’s meme at Rambling in the Garden. And thanks so much again for hosting, Cathy! This meme is really forcing me to slow down and ENJOY my garden. This entry was posted in A vase on Monday and tagged Exochorda macrantha 'The Bride', Fete du Travail, Lily of the Valley, Rosa banksiae 'Lutea', Spirea betulifolia, Vicia sativa on May 1, 2017 by Cathy. This entry was posted in Roses, Wordless Wednesday and tagged Rosa banksiae 'Lutea' on April 19, 2017 by Cathy. The outlook over the valley is so exquisite that it would be a shame to interfere with it. Maybe I haven’t succeeded, but the Mirror Garden remains one of my favourite places in spring, mostly on account of the young growth on the box and the flowering euphorbias, which are properly up and running now. They are E. characias subsp. wulfenii and E. characias subsp characias, courtesy of Hardy Plant Society Seed. Just coming into flower on the tower behind my blue pot in the picture below is Rosa banksiae lutea. It grows like a weed – thank goodness. Below the Mirror Garden in the Rose Walk I find photography much more difficult. It’s looking good at the moment – but it’s never very photogenic. And unfortunately I chose to shoot it when the grass and baby box balls hadn’t been cut, which doesn’t help much. I need to learn how to use my new camera – even Ella has a tinge of green about her! For the first time this year I managed to get my bulb order in fast enough to buy Narcissus ‘Jenny’ and ‘Jack Snipe’. There have been no daffs in the Rose Walk since I planted it in 2012, and I knew I wanted white flowers before the tulips. Owing to the cool weather, I enjoyed them for what seemed like weeks – they’ve only just left us. Hard on their heels came the tulips. In the front portion of the walk (which is divided into four) I’ve got ‘Queen of the Night’, ‘China Pink’ and ‘Sorbet’ combined. The ‘Sorbet’ added in autumn 2015 have been a little strange. The first bulbs I bought in 2012 had a white edge to the leaf and a quite a strongly reddish ‘flame’ on the tepals. Last year’s additions (I leave them in the ground and add a few more every year) are very pretty, but much more pastel in colour and no white edge to the leaf. Will the real ‘Sorbet’ please stand up? I need to do some research. You’ll notice in the pictures that because I leave my tulips in the ground I end up with smaller, more graceful flowers. Not to everyone’s taste, but certainly to mine. I love to see plants growing as if they were in a meadow, not standing up to attention like my slaves. Unfortunately, I have now learnt that my habit of jamming everything in together in these borders is not entirely healthy. The tulips are followed by lots of alliums, nepeta and the roses: then everything falls rather quiet during the summer, although I’d like to start adding penstemons as well. There’s even the odd camassia jostling with the rest. It seems that all is quiet on the Western tulip Front now – and I’ve been taught a lesson. My tulip greed has got to be limited for the sake of the plants. Either that or do without them for three years. Walking round the corner of the Rose Walk down to the Long Border another difficult-to-photograph sight greets me. Is this actually because my borders are badly planned? Perhaps – but I think that what they really need is a bit more structure (to counter-balance my natural tendency for border madness). The Rose Walk would benefit from a paved walkway instead of a grass path, the Long Border from, perhaps, a low hedge at the front? Looking down from the Mirror Garden on the Rose Walk (with the tulips at the far end) and the Long Border in front of it. They form a kind of oblong unit, with a bank running down from the roses to the Long Border. ‘Westpoint’ with Narcissus ‘Actaea’, about a week ago. The first tulips to greet you are ‘Westpoint’ and ‘Flaming Spring Green’. Disappointingly some of the flowers of the latter haven’t exactly flamed as I wanted – but I’m getting used to them now. A ‘Flaming Spring Green’ refusing to flame! Further along a little patch of Apricot Parrot that I had up on the Supper Terrace in pots last spring. This year the cheapskate gardener bought a Lidl mix for the same pots called ‘Night & Day’ (below). I think it might be a combination of ‘Queen of the Night’ and ‘Shirley’ (with a slightly pinkish rim to the tepals). And finally the tulip that’s really had me struggling with my new camera – a nameless red lily-flowered acquired in Lidl three years ago. (Can anyone hazard a guess?) Grown with ‘Attila’ (purple). Now I love my new DSLR, but my pea-brain has still to fathom its complexity. I kept thinking when I looked at the pictures of my red tulip that I’d got the colour balance wrong. There was something garish, luminous, almost unearthly about them. Yesterday I decided that they really are that colour … lovely in a border, but more shocking on a computer screen! Here it’s a case of ‘the rain it raineth …’ at the moment. I had just finished digging, planting and strimming the Hornbeam Gardens when this is what happened. When you start to divide herbaceous perennials for the first time, as I have this year, you know you are really gardening at last. Although I’ve gardened on clay before and the garden here is very warm, I’ve never known plants to establish as slowly as they do at Châtillon. There are roses that I’m still talking to sweetly after three years in the ground … but, yes, I’ve finally made a garden! This entry was posted in Bulbs, corms, tubers & rhizomes, Roses, Tulips and tagged Euphorbia characias;, Rosa banksiae 'Lutea', Tulip fire, Tulips: 'Sorbet' 'Queen of the Night' 'China Pink' 'Sweet Harmony' 'Westpoint' 'Flaming Spring Green' 'Attila'; on April 25, 2016 by Cathy. Wordless Wednesday & a Happy New Year! This entry was posted in Wordless Wednesday and tagged Mirror Garden, Rosa banksiae 'Lutea' on December 30, 2015 by Cathy.